How is a Ratboy Comic Made? First off, I write the comic. As of this blog post, I’ve completely written about half the Ratboy story. I constantly revise it and add little jokes as I see fit, change gags that seemed rushed or convoluted, and do my very best to not resolve things with Deus Ex Machinas – even though it’s an occasionally funny and super convenient literary device. I have the rest of the story loosely lined out and write in whenever I feel like – which is why I write so far ahead because I get distracted easily. 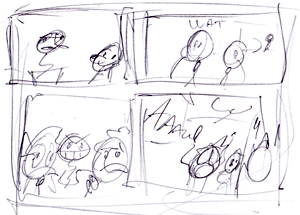 When it comes time to actually draw the comic, I first draw a very rough outline for composition. This usually takes about sixteen seconds. I time myself. Mainly it takes such a short amount of time because I get lazy. I don’t always have as much time as I’d like to draw these comics, and I wish I did, because I could get better compositions rather than lame ones. It really depends on if I’m in a hurry or not. I tend to leave the backgrounds blank at this spot unless it’s necessary, easier, or otherwise prudent, such as in the final panel pictured here. I do this mostly to give me more flexibility when reevaluating things like the composition for each page, and to make sure the backgrounds actually work with the much-more-important foreground.